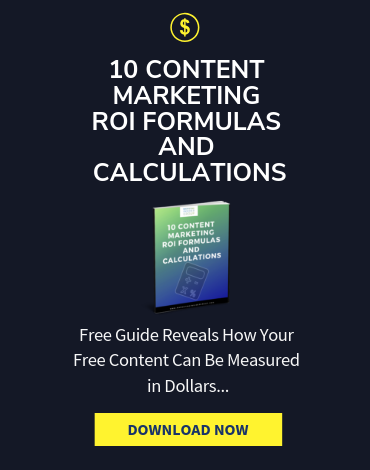 Earlier last month the Content Marketing Institute (CMI) and MarketingProfs released their highly anticipated annual B2B Content Marketing Benchmarks, Budgets and Trends report, which painted a much more positive picture of content marketing compared to last year’s findings. 62% of B2B marketers reported that their organization’s overall content marketing approach this year is much more or somewhat more successful than a year ago. 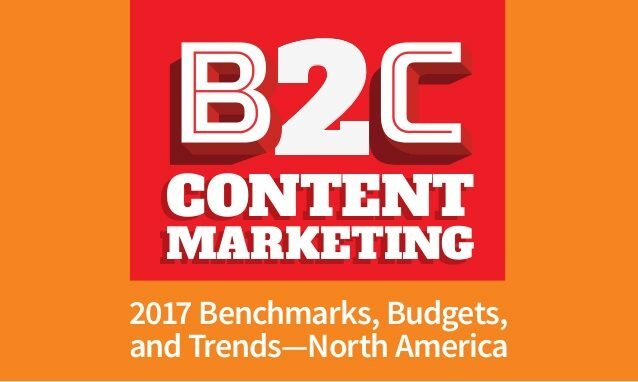 Similarly, the B2C Content Marketing – 2017 Benchmarks, Budgets and Trends research, which was released last week, shows 63% of B2C marketers have rated their organization’s content marketing approach as much more or somewhat more successful compared to last year. 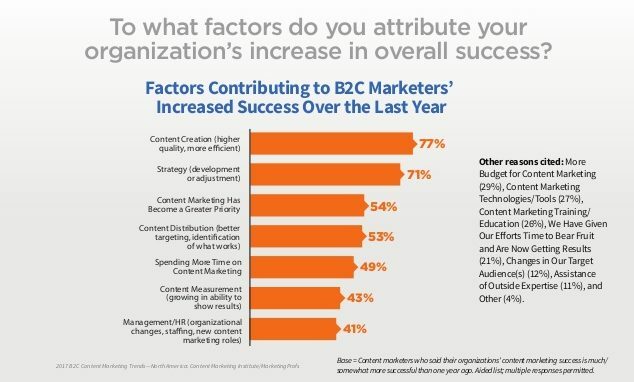 Which key factors do B2C marketers attribute to their organization’s increased content marketing success? The top three reasons were higher quality, more efficient content creation (77%), strategy development or adjustment (71%), and content marketing becoming a greater priority (54%). Rounding out the top five key factors were content distribution (53%), meaning better targeting and identification of what works, and more time spent on content marketing (49%). When asked about the top factors contributing to their organization’s stagnant content marketing success, B2C marketers cited strategy issues (49%), such as lack of strategy development or adjustment, lack of time dedicated to content marketing (48%) and content creation challenges (37%) as the top three reasons. Rounding out the top five key factors were management/HR issues (32%), such as organizational changes or staffing issues, and content marketing budget challenges (28%), such as budget cuts or inadequate budget. While 60% of B2C marketers reported that their company is extremely committed or very committed to content marketing – with 71% stating their organization is focused on building long-term relationships with customers and prospects, rather than on expecting quick, campaign-like results from their content marketing efforts – only about half of all B2C marketers agree that their leadership team gives them ample time to deliver and demonstrate content marketing results. 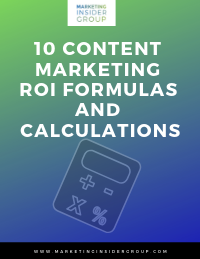 But content marketing is a long-term investment. 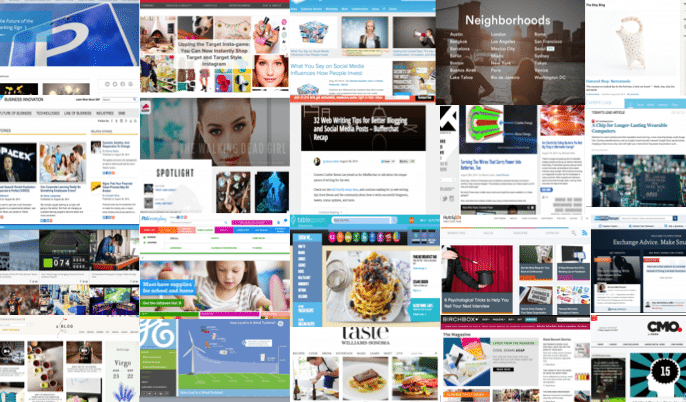 It takes time to develop an effective content marketing strategy, figure out the best channels for distribution, identify what’s working and isn’t, measure effectiveness, and finally produce results. 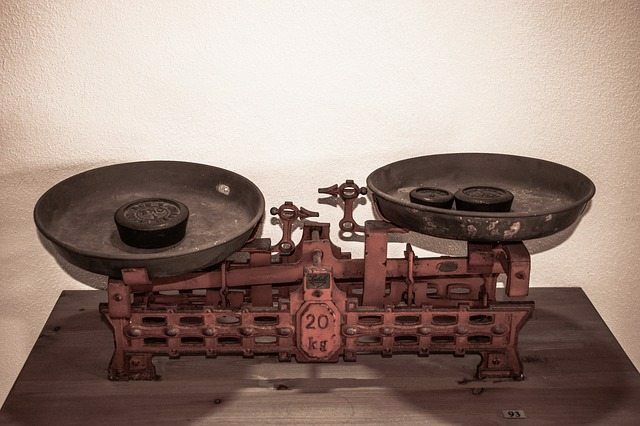 Time and commitment are two key ingredients for content marketing success, and it is crucial for leadership to understand and support that. 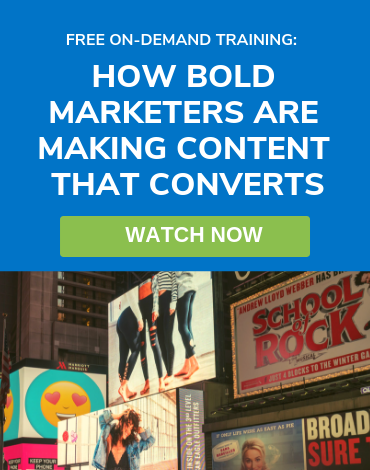 63% of the most successful B2C marketers have a documented content marketing strategy. 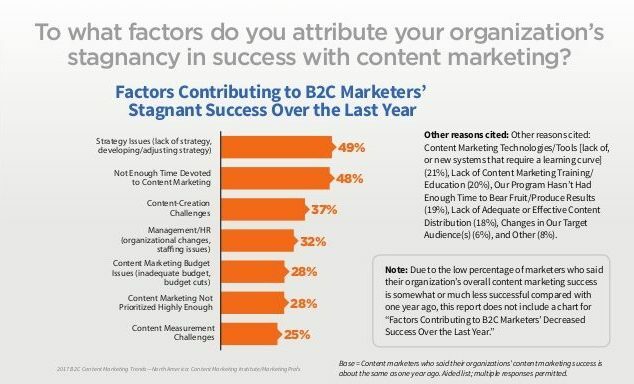 When all respondents were asked about the effectiveness of their content marketing strategy in helping their organization achieve their content marketing goals, 7% of B2C marketers reported extremely effective with 28% very effective and 53% moderately effective. 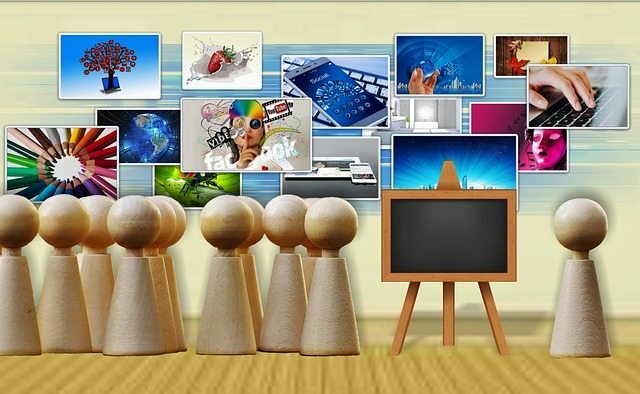 When asked about the top content marketing tactics their organizations use, B2C marketers reported social media content (85%), blogs (75%), email newsletters (75%), pre-produced video (60%), in-person events (59%), infographics (48%) and illustrations/photos (45%). B2C marketers believe that social media content (58%), blogs (51%) and email newsletters (43%) are the top three most important tactics to the content marketing success of their organizations, which they will use in 2017. The top three channels B2C marketers reported that their organizations are currently using to distribute content are email (89%) and Facebook (89%), which tied for first place, followed by Twitter (73%) and LinkedIn (66%). B2C marketers rated that email (91%), Facebook (68%) and print (62%) are the top three most important channels to their organization’s content marketing success. Rounding out the top five are YouTube (60%) and LinkedIn (57%). The top five content marketing goals that B2C marketers say their organizations will focus on in the next twelve months are brand awareness (74%), audience engagement (71%). lead generation (66%), customer retention/loyalty (63%) and sales (53%). And the top five metrics B2C marketers reported their organizations are using to evaluate their content marketing performance are website traffic (73%), social media sharing (66%), time spent on website (54%), sales (53%) and higher conversion rates (50%). 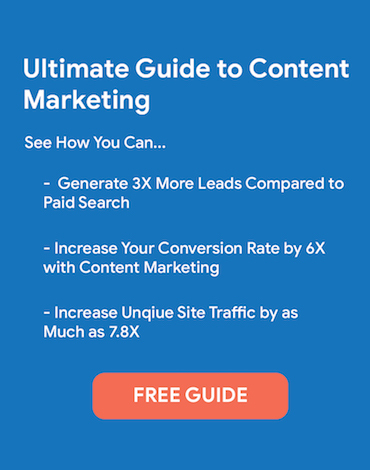 The metrics B2C marketers believe that their organizations are using which provide truly measurable results of their content marketing efforts are website traffic (44%), sales (35%), higher conversion rates (32%), social media sharing (29%) and SEO ranking (25%). To learn more about the study, check out the complete report below.